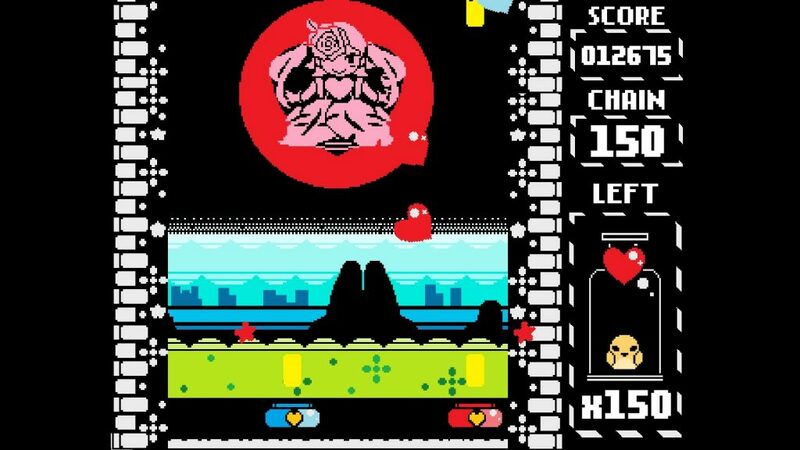 Super Weekend Mode by London based solo developer Pixel Teriyaki is the latest from Ratalaika Games. It’s a retro styled pixel art shoot-em-up and fun with it, although in typical Ratalaika fashion the trophies are straightforward to unlock. A complete rinse with a mere thirty one minutes elapsing from our popping the first trophy to getting a platinum. 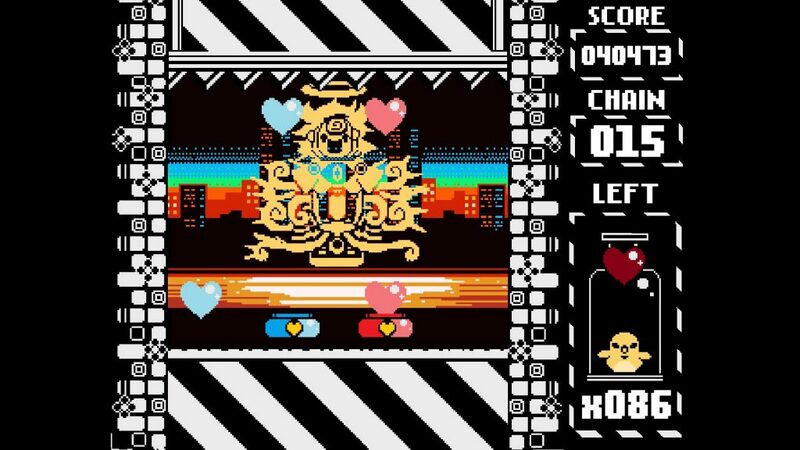 You choose between one of six distinct cutesy characters at the outset: the default all-rounder, the beginner archetype with more lives, the speed demon, the 1cc loony option, the shielded at outset fallback and the gunner who leads to bosses having more health. Quite why you’d choose to make the game harder is beyond us, as its certainly no pushover challenge wise. Then you can choose a difficulty level ranging from easy to nails hard. You’ll score more points going with a higher difficulty naturally, though it helps there’s a trophy for choosing the hardest option. Easy isn’t actually that easy though, as we struggled to progress beyond level four on our platinum run. We went with the 1cc option and hardest difficulty to begin with, yet didn’t get past the second level due to our having skimmed the tutorial without having absorbed the pertinent facts. Upon returning to the tutorial and actually reading it, we soon returned and… didn’t get past the second level. 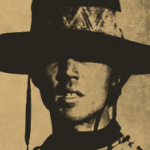 Perhaps our choice of the 1cc character wasn’t the wisest move. Upon choosing the stock model, we made a little more progress. The only controls you have to worry about are the shoulder buttons to move your two paddles left and right: is lanes one and two, is lanes three and four. It makes sense when you play it anyway. 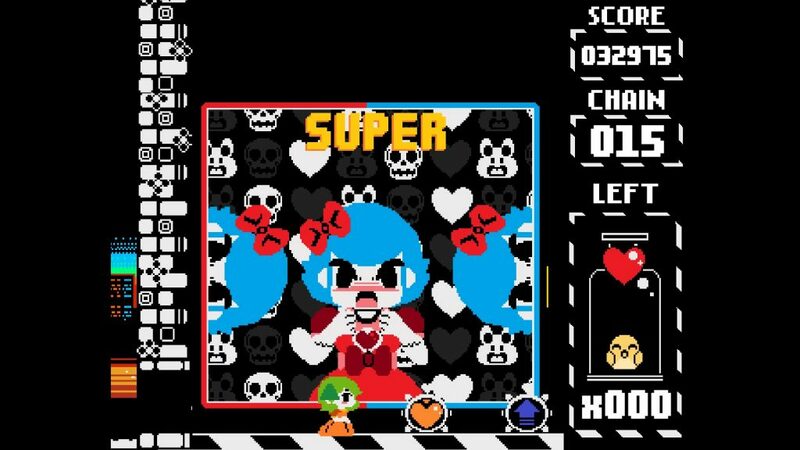 Graphically the cute hearts and general style brought to mind a hybrid of NES Tetris and the Love Lab minigame in Rhythm Paradise 3DS. Coupled with the music and sound effects you’d swear blind this was developed somewhere in Japan. After a while you get stuck into a rhythm and get a real feel for the flow of the levels. 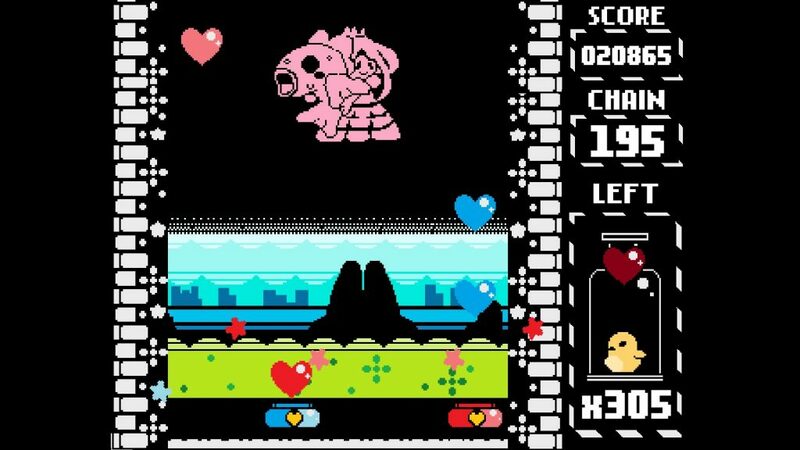 Collecting the hearts being the main task at hand you need to avoid the skulls (instadeath) and bump the dustbunnies. It’s all a matter of timing and to get anywhere you need to almost let yourself go and relax. Once skulls are added to the equation the difficulty does hit something of a wall. 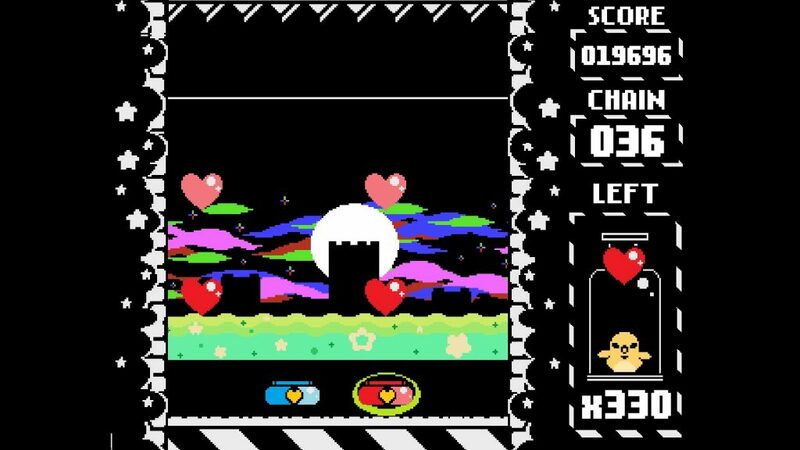 There’s some interesting mechanics in here, the collecting hearts to finish a level as well as shooting the level boss both being valid strategies. Just as the shunting into the side of dust bunnies is an interesting timing challenge. If you miss hearts or a dust bunny gets past the play area will get smaller and smaller until it flashes red and if you fail once more, you’ll lose a life. If you do though, you’ll continue where you left off without penalty. 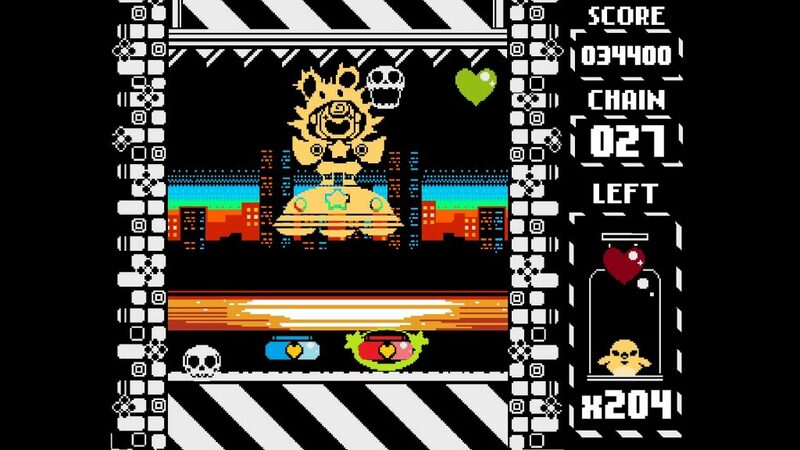 It makes completing a level a bit easier than you might expect, almost contrary to the score attack bullet hell vibe that otherwise prevails. Complete a level and, depending on your character, you’ll be rewarded with a blend of power ups ranging from extra lives to speed increases and points in between. The music and sound effects are very retro tinged, initially they’re cute but soon grate. They’re definitely in keeping with the general style of the game though. Super Weekend Mode being a Ratalaika release, the trophies are over almost as soon as you’re getting your teeth into the gameplay and starting to gain an affinity for the strategies you need to progress further. The most challenging trophy was for completing level three, but even that was made trivial by choosing the character suggested for those prone to mistakes with a shield. It saddens us a little that what is clearly a labour of love by our man in the nation’s capital is likely going to be reduced to a low hanging completion for achievement whores. A canny strategy for sure as this will surely shift more copies than if it were a more challenging max. If you’re a score attack sort of player though, Super Weekend Mode is definitely your sort of game as you’ll enjoy the variety of strategies you can utilise with the different character types. - Music doesn't take that long to grate. Interesting gameplay mechanics and cute retro styled graphics belie a fierce challenge. Sadly Super Weekend Mode is another easy Ratalaika platinum that deserves better than its probable fate of a one and done. A good game with trophies that let the side down. Ian bought an Xbox One for some reason but finally answered the PS4 call in late 2016 and is now our reason to request NFL games for review.